The reigning champion dirt mare in America has picked up the riding services of one of the top jockeys in the world. Charles Fipke's homebred Forever Unbridled will be united for the first time with Mike Smith in the $10 million Dubai World Cup sponsored by Emirates Airline (G1), which was confirmed by trainer Dallas Stewart on Monday. Velazquez, who is committed to riding Audible in the Florida Derby (G1) on March 31st, rode Forever Unbridled in her last racetrack appearance in November, a half-length victory over subsequently crowned champion 3-year-old filly Abel Tasman in the $2 million Breeders' Cup Distaff (G1). A race prior, under Joel Rosario, the 6-year-old bay mare defeated heavily favoured champion 3-year-old filly of the previous year, Songbird, by a neck in Saratoga's Personal Ensign (G1) in late August. Smith was aboard both Songbird, whom she caught in the final stages, and Abel Tasman, whom she held off just the same. “If you can't beat them, join them,” Smith said. “Her last few races have really been tremendous. She's running the kind of races where she can definitely compete with the boys. She's a big filly, too, and pretty much as big as the boys she'll be running against, so I'm very excited about the opportunity to ride her. Adding intrigue to the affair is the fact that Bob Baffert-trained West Coast, the reigning champion 3-year-old in America and expected favourite in the Dubai World Cup, was previously the mount of Smith. They teamed to take the two 2017 races that earned him said title, the Travers (G1) and Pennsylvania Derby (G1). Jockey Javier Castellano will be aboard West Coast in the Dubai World Cup and has ridden him in his previous two races, a third in the Breeders' Cup Classic (G1) and runner-up effort in the Pegasus World Cup Invitational (G1). The Castellano-West Coast match was originally necessitated when Smith chose to ride world champion Arrogate in the Breeders' Cup. The plot thickens, as Smith and Castellano are no strangers in battle recently. Last weekend, they were involved in a high-profile throw-down between two of the leading contenders for this year's Kentucky Derby (G1) that ended in a controversial disqualification. Smith's mount, Baffert-trained McKinzie, was disqualified for interference with Castellano's Bolt d'Oro after drifting out during a stretch-long battle in the San Felipe (G2) at Santa Anita. “West Coast will be the favourite and we have to have a successful trip to beat him,” Smith said. “If there's someone in the race who can upset the applecart, it's Forever Unbridled and I'm excited about it. I think she'll perform really well. After a Super Saturday (March 10th) at Meydan Racecourse, where frontrunners performed quite well, Forever Unbridled's closing style may appear to be at a disadvantage. Despite that, Smith remains confident. 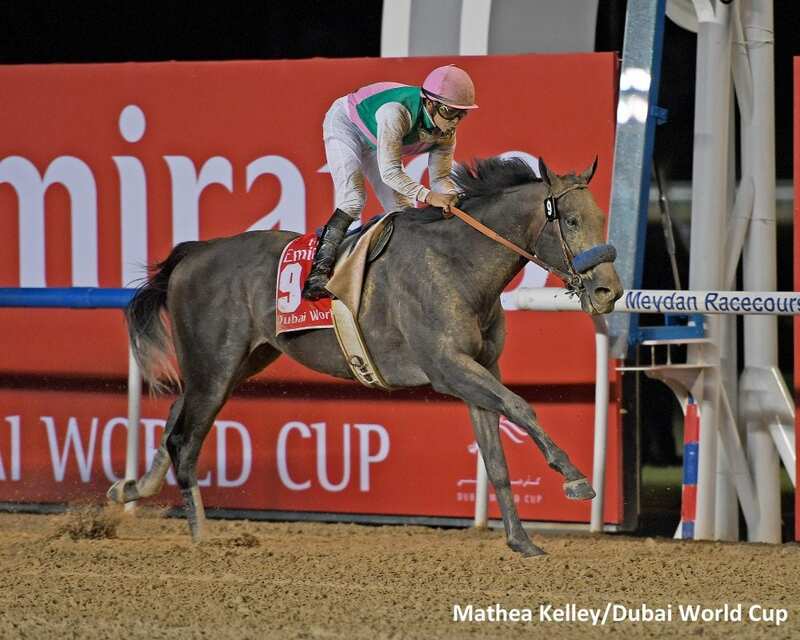 Smith has fond memories of Dubai from last year, having been aboard Arrogate in his dramatic last-to-first Dubai World Cup victory that still resonates on racing's collective psyche. Like Arrogate, Forever Unbridled is an offspring of champion Unbridled's Song, whom Smith was the regular rider for during his 1995-97 career. “He was a great racehorse and then was a great sire,” Smith said. “The good ones are just really good. They'll get the distance and either come with a run or have that high cruising speed that will continue on. They can do it all. (Unbridled's Song) was tremendous. In addition to Songbird and Abel Tasman, Smith also piloted top mares Zenyatta, Royal Delta, Inside Information, Stardom Bound and Azeri. This entry was posted in NL List, Racing and tagged arrogate, Bob Baffert, dallas stewart, dubai world cup, forever unbridled, Javier Castellano, mike smith, west coast by Press Release. Bookmark the permalink.